RALEIGH, N.C. (AP) — In the storm-weary Carolinas, Hurricane Michael's approach is stoking fresh fears among homeowners who still have tarps on their roofs or industrial dehumidifiers drying their floors from destruction left by Hurricane Florence. 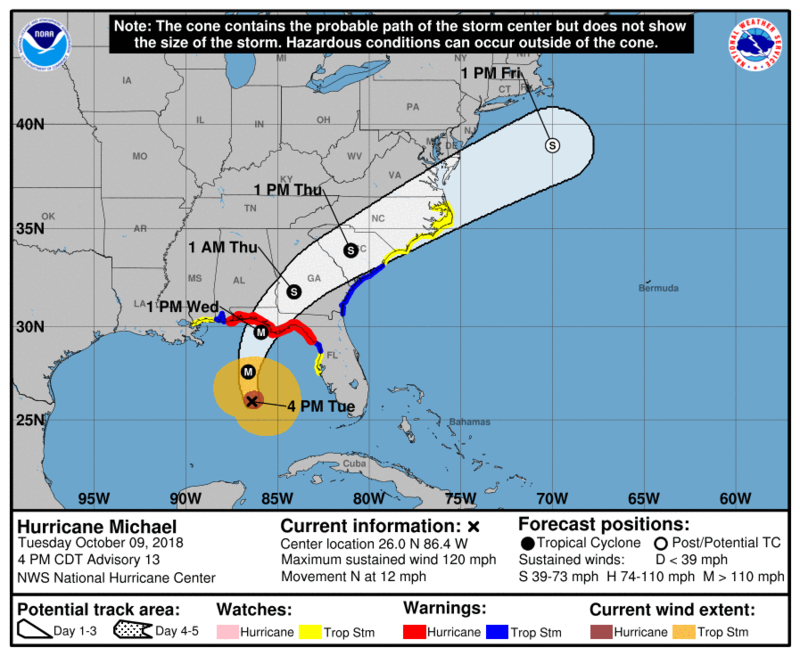 While the Carolinas won't get a direct hit, even a weakening Michael is expected to bring strong winds and inches of rain. North Carolina Gov. Roy Cooper warned that Michael is expected to bring tropical-force winds and 2-5 inches (5-12.7 centimeters) of rain across much of the state. While the storm wasn't expected to cause major river flooding like Florence did, he urged people to stay vigilant. In South Carolina, Gov. Henry McMaster estimated to federal officials that Florence's damage would top $1 billion. Earlier this month, the state said about 1,600 homes — and counting — were damaged, including 55 that were destroyed. South Carolina emergency officials warned of heavy rain, strong winds and possible tornadoes from Michael. Forecasters don't expect widespread Carolinas flooding, but said Michael's winds could be stronger than Florence's. "The rivers will go up briefly, but they shouldn't come near the levels after Florence," said National Weather Service meteorologist Carl Morgan. Michael has been the talk of Cheraw, a South Carolina town of 5,800 where Florence flooded dozens of homes. "Everybody is saying 'not again,'" Cheraw Police Chief Keith Thomas said Tuesday. But it's not river flooding that worries Thomas this time around; it's the wind and the saturated ground. Cheraw prides itself on stately elms that have lined its streets since town fathers drew up plans nearly two centuries ago. "Any amount of wind could topple over our older trees," Thomas said. Back in Wilmington, tarps cover Fernando's house where a tree crashed onto it a few miles from Florence's landfall. He worries about new damage from Michael just as he's drying out from the earlier storm. He's working with insurance adjustors while paying for some work out of pocket with hopes of reimbursement: "That's all still being worked out, little by little." In Pender County, Michael threatened to compound woes for the Cross Creek neighborhood, where Florence damaged houses. Sarah Robles' family has been staying at her father's house after floodwater seeped into floors, mold grew on ceilings and the windows and roof were damaged.